As explained previously (see The Importance of Fitting In) when we wrap our bungalow with strawbales the bedroom that projects forward of the main building will remain as brick outside, in order to visually tie the building with the other brick bungalows in the street and appease the planners (see Elevated Greenery). This presents some problems. We want the whole building to be very well insulated and maintain a comfortable temperature without central heating. 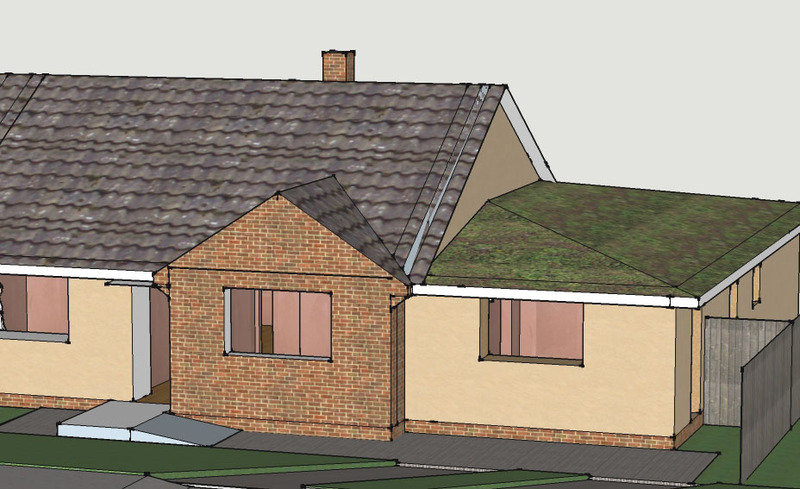 The cavity walls of the existing bungalow will be filled (with glass-fibre granules made from recycled glass) but this only gives a U-value of around 0.57. To achieve a central-heating-free home, we need the external walls to have a U-value of around 0.15 or less (there's some explanation of U-values here). 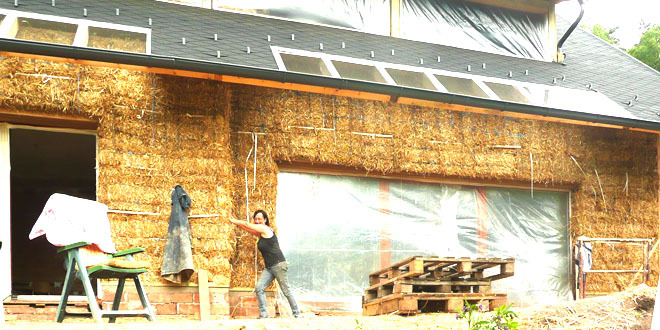 The strawbale wrap will easily achieve this for most of the building. But in order to retain the external brick wall of that bedroom some kind of internal insulation will be needed there. This in turn, presents some problems. Had another meeting with the local planning officer last week. 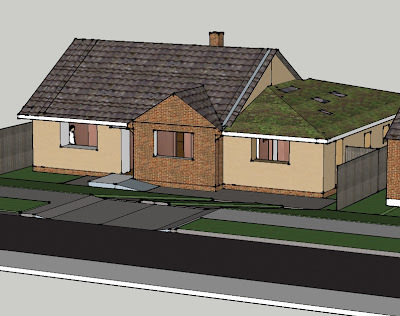 We thought it was about time to check they were supportive of our plans in general, and wanted to ask specifically how they might feel about a green-roofed extension. There was a bit of humming and hawing, with the uncertainty based on the fact that externally insulating the bungalow with straw would turn it into a rendered bungalow surrounded by rows of near-cloned brick bungalows. 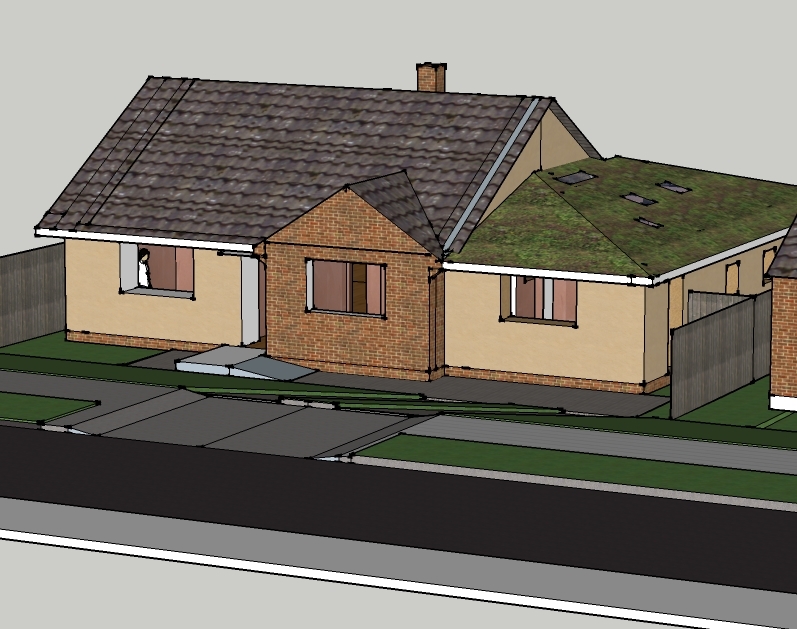 But they understood and seemed impressed by the reasoning behind the project (to bring a cold and damp bungalow up to at least level 5 of the Code for Sustainable Homes, making it warm, dry, cosy and healthy using the most sustainable materials we can). However, ultimately they appeared to be convinced that our compromise of leaving the projection at the front of the bungalow as brick and internally insulating that section was acceptable and enough to visually tie the building in to the rest of the street. Internally insulating is not ideal as there is more potential for condensation problems where the insulation meets the cold-hard surface of the external wall in a way which is not an issue with breathable external insulation - more on this in the blog soon. We've had a change of plan about the massage treatment room which outwardly may not be very exciting but it was something that had been increasingly niggling at me, starting to consume a disproportionate amount of nervous energy, and turning mild concerns into raging anxieties. Possibly the most absurd of these escalated worries stemmed from the fact that my clients tend to be a touch spaced out after a massage, coupled by the fact that most would drive to appointments: would I indirectly be the cause of hideous car-crashes as floaty-headed clients headed out into the tiny rural lanes, their response times fatally compromised? Well, probably not. As a massage-therapist friend pointed out "most of my massages are where they come to me and they have to drive. I haven't yet heard that anyone has had a crash!". I think this was an example of other underlying and more sensible worries getting randomly focused on that one idea, preventing me from having to deal with the real issues. By way of showing that wrapping a building in straw really is a viable and sensible option, below are photos of the strawbale wrap completed by Jakub Wihan (Kuba) in the Czech Republic. The external appearance of roof and window details is likely to be different in our project, but the Czech build gives a good idea of what's possible. Many thanks to Kuba for use of his photos.